France, 2014, 85 minutes, Colour. Voices of: Roger Carel, Alexandre Astier, Alain Chabat. Directed by Louis Clichy, Alexandre Astier. This is another amusing animated version of the celebrated comics by Ren Goschiny and Albert Uderzo. 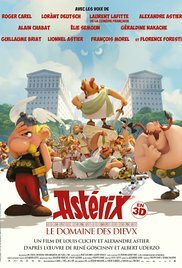 The adventures of Asterix and his fellow Gauls have been portrayed in animated films periodically since the 1960s. There have also been some live-action versions of the stories, notable for featuring Gerard Depardieu her as Obelix, made to look very much like the comic strip character. This animation film was made in 3 D.
This time there is a more straightforward story. In Rome, Caesar is consulting his advisers and upset that one small area of Brittany would not submit to the Roman Empire. Gets the brainwave of setting up a Roman colony adjacent to the Gauls village. There is even a competition and a Roman family gets the prize and an apartment in the village – though they have to keep supplying documentation and are soon turfed out. What are Asterix and Obelix and the other Gauls to do. While they are at war with Rome and there are clashes, there is some accommodation with Caesar in the setting up of the village. Nevertheless, the Gauls use their wiles to deceive the Romans and upset Caesar and the village, even appearing in the amphitheatre and offering entertainment with bird sounds. There are many of the familiar features, especially a potion that gives giant strength to those worlds albeit; there is a range of slaves, especially black slaves and some comedy about an general trying to dispose of a tree which Obelix always picks up and replaces; and, the Gauls have an ability not only to replace a tree but to multiply trees even to a forest, to the continued exasperation of the Romans. Asterix and his friends want to keep the environment as well is put the Romans at Bay – and habitability to knock down multi-storey buildings almost as soon as the Romans built them up. And, as always, there are very funny names, which are enjoyably rendered into English funny names – and there is always the dog, Dogmatix. There is also some final play on Caesar and his famous quote about coming in conquering, Veni, Vidi, Vici.